Silversea Cruises will announce that it will move Silver Cloud to its luxury expedition fleet in November 2017. Destined mostly for polar waters, the elite 296-guest ship that launched the ultra-luxury cruise line will be converted into an ice-class ship during an extensive refurbishment scheduled to start in August 2017. 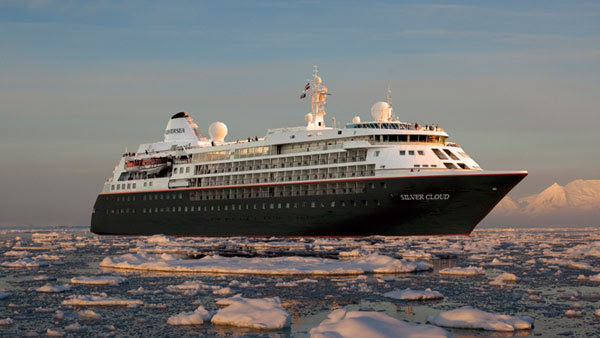 As an expedition ship, the all-suite Silver Cloud will accommodate 260 guests and also sail on itineraries to non-polar regions. When sailing Arctic and Antarctic itineraries, the guest complement will be restricted to 200. Silversea is a member of the Association of Arctic Expedition Cruise Operators (AECO) and the International Association of Antarctic Tour Operators (IAATO), and adheres to each organization’s guidelines to ensure sustainable tourism. These include such measures as limiting the number of guests going ashore in certain areas of the Arctic and allowing for a broader range of Antarctic landing sites for expedition ships with no more than 200 guests. The luxury expedition line currently has three all-suite expedition ships, Silver Explorer, Silver Discoverer, and Silver Galapagos. Collectively, they explore over 500 far-flung destinations, from Africa, Australia’s Kimberley Coast, and the Russian Far East, to the Galápagos Islands, the British Isles, and the polar realms.